''My name is Bridget Chappell. 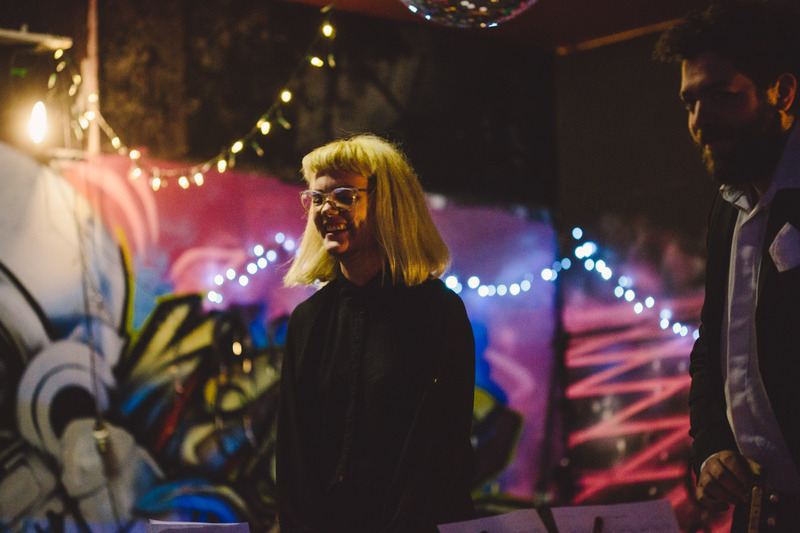 I run the Sound School: a Melbourne-based community school that’s taking on inequalities in electronic music. We run free workshops in skills like: DJ-ing, Ableton, synth building, circuit bending, and more. The School is open to everyone, especially women, LGBTIQA+ folks, people of colour, with disabilities, and on low incomes. After all, electronic music wouldn’t be what it is today without these communities! This dream only started to become a reality after an accident at my day job as a bike messenger. Not only could I not ride my bike after, but I couldn’t play my cello either. I just had to focus on the music I could play one-handed, like on my laptop! I started teaching myself how to make electronic music two years ago, and most of that knowledge has been super hard-won. This stuff is complicated, expensive, and pretty hard to access socially for lots of people. A 2015 Forbes list of the highest paid EDM (Electronic Dance Music) DJs are all male and mostly white. These dynamics trickle all the way down in music scenes : who is taken seriously, who is encouraged to take it up at all, who is paid, who is booked, who teaches, who learns, and who shapes different kinds of music. Meanwhile, I saw artists of diverse backgrounds all around me in Melbourne making amazing music, based on skills they fought hard to learn. I wanted to celebrate them and learn from them so I started putting together our first program: the Winter Sound School. We ran 12 workshops, facilitated by 14 local artists, attended by over 200 people. It was incredible. The project was completely self-funded, run by volunteers, which has now turned into a community of skill-sharers. So many people who came were so excited that something like this exists, and that after coming to the School they felt close to finally being able to actually make the kinds of music that inspires and connects them. The pilot program went so well that we won The Age Music Victoria Award this year for Best Experimental/Avante Garde Act!